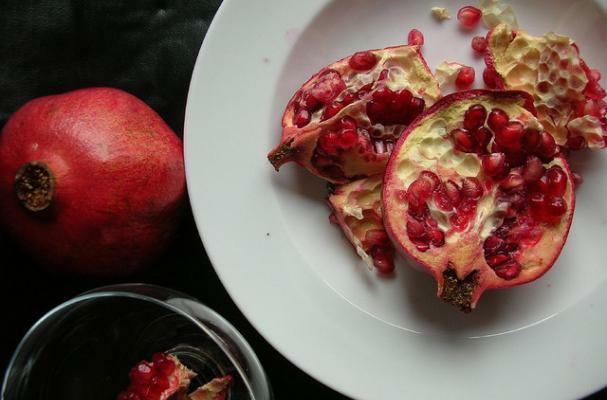 This week's Thirsty Thursday theme falls back on my favorite fall fruit: pomegranate. While they ripen throughout the year, the United States doesn't usually see commercial pomegranate crops until this time of year. Whether you choose to juice your fruit or buy a bottle of POM Wonderful from the refrigerated section, these elegantly sophisticated cocktails are perfect for autumn entertaining! This classy cocktail is just the right combination of sweet, tart, floral, fruity and festive -- not to mention bubbly! With a freebie Pomegranate Rose ice cream recipe! Sweet-tart pomegranate, fresh grapefruit juice and campari (an Italian bitter) make for an amazing combination. Prosecco, cranberries and pomegranate juice make for a smashing trio in this simple punch-style cocktail. Great for entertaining! The new signature of this fabulous hotel, this combination of pomegranate and absinthe leaves little to be desired. Simple, elegant and incredibly mysterious!